On the streets, there is a rugged mixture of steam, sweat, and dirt. 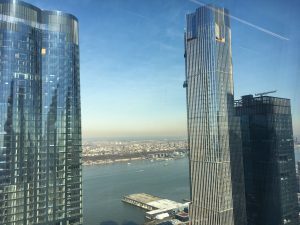 The results of this construction site are buildings made of steel, glass, and luster, which, even by New York standards, still seem massive. Inside, understatement and a Scandinavian feel prevail in the SAP office: slim design furniture, airy rooms, comfortable group seating. 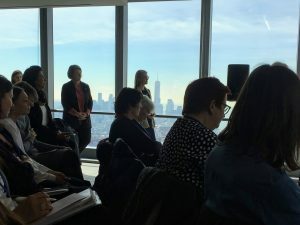 The sunshine outside, however, reflects the joy felt by the international delegates of the 63rd UN Women’s Rights Commission and their cooperation partners at reuniting, who can now forge further coalitions at this side event. I am happy to see the high-level professionals and to be part of the group. 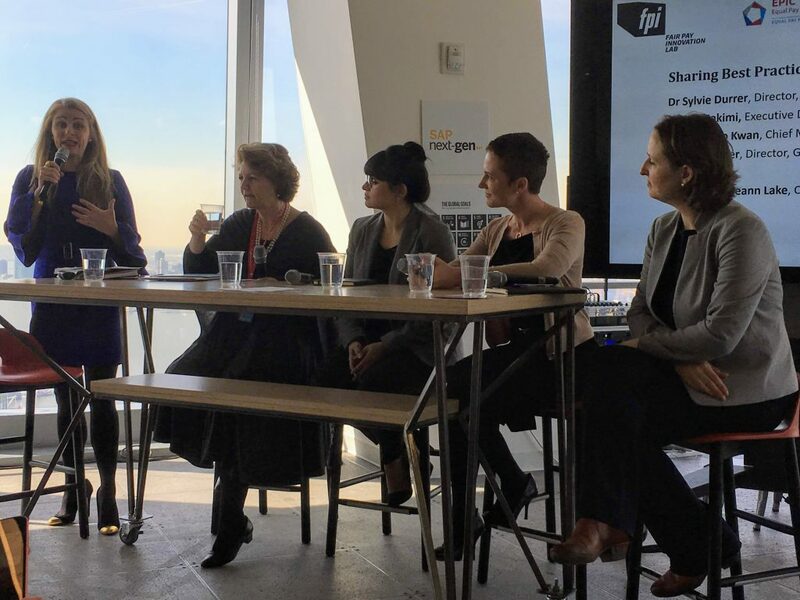 Thanks to the Fair Pay Innovation Lab, which, under the direction of Henrike von Platen and through the organization of Katinka Brose, has once again skillfully put together a truly international meeting this year, rendering “Equal Pay” a dismal topic no longer. As always, von Platen greeted participants with a very lively and somewhat provocative welcoming address: “As long as the boys feel comfortable, there will be no momentum.” Addressing this issue exclusively from an economic point of view does not suffice. Management must be called to account on a larger scale, a guideline for which is laid out in the Agenda 2030. To explain, the Agenda 2030 is a declaration of the United Nations that establishes all necessary framework conditions to ensure sustainable development by 2030. Although we may be inclined to be cynical in view of these lofty goals and the current state of politics, it would be even more impossible without them. Hence my respect for the women around me who make strides within these institutions and do not despair! What exactly does the Agenda 2030 say about women’s rights? The keynote speaker was Dr Patti Fletcher, who works for SAP and is an expert in gender equality and cultural transformation and leadership, making her the ideal representative of the Agenda 2030 goals. Fletcher stressed that it is far more important to change the current system than to continue to brandish a moral cudgel against men or to constantly tell women how they have to individually change to fit the system. 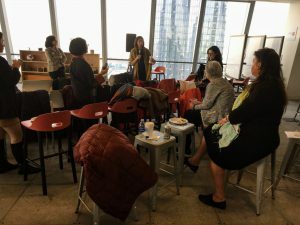 For her, “Female Leadership” is the order of the day, which she expounds upon in her book with the support of case studies, ‘Disrupters: Success Strategies From Women Who Break The Mold’. The panel discussion concerning best practices on fair pay was moderated by Roseann Lake, who immediately made an impression with her energetic performance. She is currently the Cuban correspondent for the Economist, where she was also the Chinese correspondent for five years. She, too, has written a very interesting book germane to the topic at hand about unmarried women in China who are deemed to be “leftovers” from the age of 27. Because of this apparent discrimination, however, these women are able to enjoy relative success in their careers and have become an increasingly important factor in the Chinese economy. 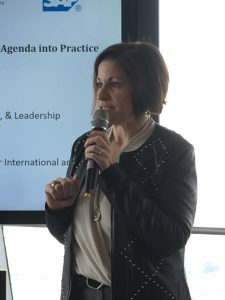 Lake welcomed panel participants Dr Sylvie Durrer, Director of the Equality Authority FOGE in Switzerland, Sherry Hakimi, Managing Director of genEquality, Tifenn Dano Kwan, Marketing Director of SAP Ariba, and Hilary Spencer, Director of the Government Equalities Office in the UK. Sylvie Durrer reported on the Swiss law passed last year which requires companies with more than 100 employees to report their employees’ salaries. Although there currently exist no direct penalties levied for unequal pay, the mere threat of a sullied reputation exerts pressure. Hilary Spencer, meanwhile, described the unbelievably high response rate of 100% to the UK’s mandatory reporting scheme among companies with more than 250 employees. The gender pay gap proved to be the business issue of the year in Great Britain. The fruit is ripe for the picking! The questions from the audience following the statements of the panelists focused on what the evaluated companies would have to say about their (sad) figures, what internal strategies could be formed, and what public campaigns could lead to success. And what about women who can hardly earn a living? Durrer replied that many of the companies had never collected such figures before and had been duly shocked when confronted with them. Many typical problems such as a prohibitively low starting salary or women getting stuck in middle management finally came to light. Kwan provided an example of a development measure for women from her own company, namely, a project initiated by the CEO in which employees appeared in a video and were given the opportunity to describe a goal they wanted to achieve, thereby rendering a dynamic workforce more visible. Regarding the efficacy of public campaigns, the panel cited examples such as the mass demonstration held in Switzerland that preceded the new law, or the prospect of another women’s strike in the summer of 2019, to be held in the spirit of the legendary strike in Iceland in 1975. Iceland has long been regarded as a pioneer when it comes to gender equality; in 2018, legislation was passed prohibiting and punishing gender pay discrimination, and 50% of the Parliament is female. In response to the question about precarious employment, Durrer and Hakimi stressed that a federal or state government, or even a city administration, for that matter, are equipped with the means to take countermeasures, such as the introduction or raising of minimum wage, as an initial positive step in this direction. Additional pressure from politicians on companies must be put in place, as well. After the official round of speakers, participants continued the discussion in various groups over lunch. The official meeting is a good opportunity to come together, however, experts are more likely to benefit from the informal discussions. 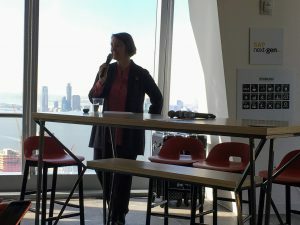 Beverly Cooper Neufeld, President of PowHer in NYC, chaired a small panel discussion during which a young woman from France wondered where all the men were and how these problems could be solved in their absence. A young man responded by confirming that the topic was indeed important to him, and reiterated that he did not know where the other men were, either. An older man in a sports jacket gave an ironic retort – why should men come if they feel no pressure to do so? And thus we were reminded of Henrike von Platen’s initial assertion – pressure must be increased.